Aqa Diya' 'Iraqi, Muhammad Husayn Isfahani, Shaykh Muhammad Jawad Balaghi, etc. Husayn Wahid Khurasani, Muhammad Taqi Bahjat, Sayyid Ja'far Shahidi, etc. Dirasat fi l-Usul, Al-Bayan fi tafsir al-Qur'an, Mu'jam rijal al-hadith etc. Supporting Imam Khomeini and Islamic Revolution of Iran, Supporting al-Intifada al-Sha'baniyya. Al-Sayyid Abu al-Qāsim Mūsawī al-Khoeī (Arabic: السيد أبو القاسم الخوئي) (b. Rajab 15, 1317/November 19, 1899 d. Safar 8, 1413/August 8, 1992) was an influential religious authority of Shi'a, scholar of rijal and the author of 23-volume set of Mu'jam Rijal al-Hadith and also the author of the exegetical work, al-Bayan fi tafsir al-Qur'an. Mirza Na'ini and Muhaqqiq Isfahani were two of his greatest teachers in jurisprudence and principles of jurisprudence. The official beginning of al-Khoei's authority is considered after the demise of Ayatullah Burujirdi and the demise of Ayatullah al-Hakim is considered the beginning of his supreme authority especially in Iraq. During fifty years of teaching, al-Khoei taught a complete course of advanced level in jurisprudence, six advanced courses of principles of jurisprudence and one short course of exegesis of the Qur'an. 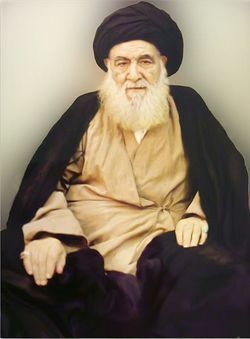 Scholars including Sayyid Muhammad Baqir al-Sadr, Mirza Jawad Tabrizi, Sayyid Ali Sistani, Husayn Wahid Khorasani, Sayyid Musa Sadr and Sayyid 'Abd al-Karim Musawi Ardabili are mentioned as Ayatullah al-Khoei's students. Al-Khoei had important opinions and views in jurisprudence and principles of jurisprudence, some of which were different with those of famous Shi'a jurists. Some sources have mentioned his different views up to three hundred ones. Opposing the view about the obligation of disbelievers in performing secondary principles of religion, not accepting relativeness of the beginning of lunar months and opposing the validity of frequency of a fatwa and consensus are some of his different opinions in jurisprudence and principles of jurisprudence. During his authority, he took measures regarding preaching of religion, Shi'a and assisting the needy, including building library, school, Husayniyya and hospital in Iran, Iraq, Malaysia, England, United States of America, India and elsewhere. Ayatullah al-Khoei was among active figures in political issues between 1962 and 1972 and took positions and sent out statements against Pahlavi regime, including his objection to the event in Faydiyya seminary of Qom in 1962. Ayatullah al-Khoei withdrew from politics for ten years, but after the Islamic revolution in 1979 in Iran, and meeting of Farah Diba, Mohammad Reza Pahlavi's wife, with him and questions raised about his meeting, he supported the revolution and the Islamic republic of Iran in cases including Iranian Islamic Republic referendum and also the war of Iraq imposed on Iran. During 1991 uprisings in Iraq and appointment of a leadership council for government of regions under control of Shi'a, he was pressured by the government of Saddam Hussein and was under house arrest until the end of his life. His father, Sayyid Ali Akbar Khoei was among the students of Abd Allah Mamaqani who immigrated to Najaf, Iraq in 1950 due to his disagreement with the illegitimate Persian Constitutional Revolution. There is no exact information about his daughters, but some of his son-in-laws are Sayyid Nasr Allah Mustanbit, Sayyid Murtada Hukmi, Sayyid Jalal al-Din Faqih Imani, Sayyid Ja'far Gharawi Na'ini and Sayyid Mahmud Milani. He studied preliminaries and higher levels of seminary in six years and then participated in the classes of teachers of different sciences including jurisprudence and principles of jurisprudence for fourteen years. As he wrote in his autobiography, he benefitted the most from Muhammad Husayn Na'ini and Muhammad Husayn Gharawi Isfahani. As well as Sayyid Abu al-Qasim al-Khoei said that he mostly benefitted from Mirza Muhammad Husayn Na'ini and Mirza Muhammad Husayn Isfahani and studied some of their books in fiqh with them, he mentioned some other teachers of his including Shaykh al-Shari'a Isfahani (d. 1338/1919), Shaykh Mahdi Mazandarani (d. 1342/1923) and Aqa Diya' 'Iraqi. Some other teachers of Ayatullah al-Khoei were Shaykh Muhammad Jawad Balaghi in theology, beliefs and tafsir, Sayyid Abu Turab Khwansari in rijal and Diraya, Sayyid Abu al-Qasim Khwansari in mathematics, Sayyid Husayn Badkubih'i in philosophy and Islamic mysticism and also Sayyid Ali Qadi. During his education in the seminary of Najaf, Sayyid Abu al-Qasim al-Khoei had discussions with Sayyid Muhammad Hadi Milani (d. 1395/1975), Sayyid Muhammad Husayn Tabataba'i (d. 1402/1981), Sayyid Sadr al-Din Jaza'iri, Ali Muhammad Burujirdi (d. 1395/1975), Sayyid Husayn Khadimi and Sayyid Muhammad Husayni Hamadani. Khoei received permissions for ijtihad from many great personalities of the seminary of Najaf in 1352/1933 including Muhammad Husayn Na'ini, Muhammad Husayn Gharawi Isfahani, Aqa Diya' Iraqi, Muhammad Husayn Balaghi, Mirza Ali Aqa Shirazi and Sayyid Abu l-Hasan Isfahani. His religious authority is reported very significant among Iranian Shi'a as well. Ayatullah al-Khoei is considered among those religious authorities who was influential among most Shi'a, including Arabs and non-Arabs. Fourteen of Mujtahids in Najaf including Sadra Badkubih'i, Sayyid Muhammad Baqir Sadr, Sayyid Muhammad Rawhani, Mujtaba Lankarani, Shaykh Musa Zanjani, Yusuf Karbala'i, Sayyid Yusuf Hakim and Sayyid Ja'far Mar'ashi announced al-Khoei as the most-learned religious authority. Sayyid Musa Sadr, on behalf of the Supreme Islamic Shi'a Council of Lebanon, announced al-Khoei as the most-learned religious authority. During his studies in the seminary of Najaf, Sayyid Abu al-Qasim al-Khoei used to teach as well and according to reports of different sources, he taught every book he studied. After the demise of Muhammad Husayn Na'ini and Muhammad Husayn Gharawi Isfahani, the classes of Sayyid Abu al-Qasim al-Khoei and Mirza Muhammad Ali Kazimi Khurasani were reported among important classes in Najaf; and thus, after the demise of Kazimi Khurasani, the classes of Ayatullah al-Khoei were the best and most crowded classes in Najaf. As al-Khoei himself wrote in his autobiography, during the many years of teaching, he never stopped teaching his students except in the days of illness or in journey. He taught intermediate level and advanced level of lessons in the seminary of Najaf for seventy years and according to reports, he held the most important class of Najaf seminary for about fifty years and students from Iran, India, Afghanistan, Pakistan, Iraq, Lebanon and some other countries participated in his class. Ayatullah al-Khoei taught a complete course of advanced level of jurisprudence and six courses of advanced level of principles of jurisprudence. He also taught a short course on exegesis of the Qur'an. Ayatullah al-Khoei was considered powerful in teaching scientific discussions. It is said that he presented discussions clearly, eloquently, orderly, without unnecessary side discussions or philosophical discussions, benefitted from hadiths and especially focused on the chains of transmissions for hadiths. His class contained a brief account of the scientific views and principles mentioned in the classes of Aqa Diya' Iraqi, Muhammad Husayn Na'ini and Muhammad Husayn Gharawi Isfahani and his own views. Different works including his books, scientific and practical treatises and scripts of teachers' classes are among Ayatullah al-Khoei's writings. Many of the works of Ayatullah al-Khoei are compiled in a fifty-volume set titled Mawsu'at al-Imam al-Khoei, forty two volumes of which is a complete course in demonstrative jurisprudence, volumes forty three to forty eight comprise a complete course of principles of jurisprudence. Volume forty nine of this collection includes some treatises in rijal, three treatises of the scripts of al-Khoei's classes and other topics; and volume fifty is al-Bayan fi tafsir al-Qur'an. Opposition with obligation of disbelievers about secondary principles of religion: al-Khoei, the same as Shaykh Yusuf Al-Bahrani and against the opinion of all Shi'a scholars, who believe that disbelievers have obligation about secondary principles as well as the primary principles of religion, believed that disbelievers do not have obligation about secondary principles until they do not accept Islam. Not accepting relativeness of the beginning of lunar months: in the view of Ayatullah al-Khoei, against the famous opinion, the time for the beginning of a lunar month is the same for all people and it cannot be considered a relative issue, because the criterion for the beginning of a lunar month, according to the views of al-Khoei, was exiting the moon from waning which is an issue in creation and is related with the positions of the sun, the moon and the earth, and is not related with different elements and regions of the earth. Opposition with the frequency of a fatwa and consensus: About the frequency of a fatwa, Sayyid Abu al-Qasim al-Khoei has views totally different from famous views of Shi'a scholars. In the views of most usuli Shi'a scholars, if a fatwa is famous among Shi'a scholars of jurisprudence, a valid hadith in conflict with it has no validity. But, al-Khoei disagrees this rule and has not mentioned the frequency of a fatwa among preferences of the topic of conflict in principles of jurisprudence. In his view, the practical frequency does not make up for the weakness of the chain of transmission of a hadith; the same way, jurists disregard for a Authentic Hadith does not invalidate it. He also questioned the validity of consensus as well; whether the reported or acquired one. However, al-Khoei considered caution in his fatwas and regarded consensus. Fatwas against a famous one: many of the fatwas of Ayatullah al-Khoei were different from the fatwas of most Shi'a jurists including: the permission of a woman's husband for her exit from the house, permission to a woman for abortion when there is a possibility of her own death, permission for permanent marriage of a Muslim man with a woman among the People of the Book, the initial jihad being unconditional to the presence of the Infallible Imam (a), ijtihad being no requirement for a judge and also the purity of animal skins imported from non-Muslim countries whose slaughtering of animals is doubtful. Before his authority, Sayyid Abu al-Qasim al-Khoei was among active figures in political issues and in some cases, it is reported that he even had serious positions. In October 1962, al-Khoei sent a telegraph to Muhammad Reza Shah and opposed the Bill for State and Provincial Councils and considered it against religion. Also, in a message to Sayyid Muhammad Bihbahani, he emphasized that "silencing the voice of a nation by force will not last long and demagogical advertisements would not solve the problems or cure the bankrupt economy and people's dissent." Also, in reaction to the event in Faydiyya School in the middle of 1963, he sent a telegraph to Muhammad Reza Shah and expressed his sadness about "the decay of the Islamic country and the policy of its rulers". One month later, in reply to the letter of some Iranian scholars, he declared the incompetency of the corrupt rulers, considered the duty of clergies heavy and regarded silence wrong. Calling the ruling regime of Iran tyrant after the massacre of people on June 5, 1963, his rule for prohibition of participation in the election of the twenty first round of the parliament and considering it invalid, his support for Imam Khomeini after his arrest and the gossips about Imam's trial were some of his other political reactions. After Ayatullah al-Khoei became a religious authority, he withdrew from politics. This period coincided with the presence of Imam Khomeini in Najaf. His silence against the events of the 1979 revolution in Iran raised objections in Iran. His meeting with Farah Diba, Mohammad Reza Pahlavi's wife in his office on November 19, 1978 fueled these objections; but in a note to some scholars, he called this meeting sudden and involuntary. Farah Diba, Mohammad Reza Pahlavi's wife, suddenly and without permission visited Sayyid Abu al-Qasim al-Khoei on November 19, 1978, the Eid of Ghadir. This meeting was made when the Islamic revolution of people in Iran had raised and Imam Khomeini was exiled from Iraq. Meeting of Farah Diba with Ayatullah al-Khoei led to his criticism in revolutionary gatherings. Therefore, in a note to Sayyid Sadiq Rawhani, he emphasized on the suddenness and involuntariness of this meeting and reminded that in this meeting, "we seriously objected about undesirable events and disasters in Iran." About this meeting, Hossein Fardoust, a close friend of Mohammad Reza Pahlavi, said, "Ayatullah Sayyid Abu al-Qasim al-Khoei had not responded to Farah Diba's request for meeting and Farah herself with Islamic hijab went to the house of Ayatullah al-Khoei. After his meeting with Farah Diba in November, 1978, Ayatullah al-Khoei supported the Islamic revolution when the fights of people against Pahlavi regime were escalated. He also supported the Islamic Republic afterwards in different cases. Before the victory of the revolution, he addressed religious authorities, Islamic scholars and people of Iran in a statement and asked people to step forward with courage and maintaining religious standards. Later, during the Iranian Islamic Republic referendum, al-Khoei called people to vote for the Islamic Republic and asked his students to participate in the affairs of the revolution. During the war of Iraq with Iran, despite the pressure of Saddam's government for supporting Iraq, he gave permission for using religious taxes for supplying the requirements of Iranian soldiers. During the exile of Iranians from Iraq in 1970s, Ayatullah al-Khoei was among the few Shi'a scholars who was not exiled. However, exiling many of his students caused a decrease in his classes. Many of Ayatullah al-Khoei's students participated in the seminary of Qom and spread their teacher's thoughts in jurisprudence and principles of jurisprudence and made the seminary of Qom, previously influenced by the scientific methods of Ha'iri Yazdi and Burujirdi, familiar with the methods of al-Khoei, Mirza Na'ini, Muhaqqiq Isfahani and Aqa Diya' Iraqi in jurisprudence and principles of jurisprudence. The most important political action of Ayatullah al-Khoei was his accompaniment with the Shi'a uprising in Iraq when he appointed a delegation of nine persons for control of the regions under control of Shi'a. Defeat of the uprisings led to Ayatullah al-Khoei's house arrest and great pressure of the government of Iraq during the rule of Saddam. Due to direct support of the uprisings of people in 1991 and appointment of the leadership council, Sayyid Abu al-Qasim al-Khoei was arrested by the Ba'ath regime and was sent to Baghdad. After two days of detention, he was sent to meet Saddam, and Saddam addressed him with offensive words. Imam Khoei Islamic Centre, London: includes the Islamic center, Imam al-Sadiq (a) school for boys, al-Zahra (a) school for girls, a meeting hall, a public library and a bookshop. Eight hundred students study in the two schools of this foundation. In this center, al-Noor monthly journal is published in two languages Arabic and English. Imam Al-Khoei Foundation, New York: includes a meeting hall with the capacity of three thousand people, a library holding more than ten thousand volumes of books, a nursery school, schools for boys and girls, each with the capacity of 150 students, Iman school for learning Arabic, the Qur'an and Islamic education of children, mortuary, etc. Imam al-Khoei Cultural Complex in Mumbai: with an area of 100 thousand square meters twenty km away from Mumbai, it includes a large meeting hall, a mosque with the capacity of three thousand people, a library holding fifty thousand volumes of books and a husayniyya with the capacity of seven hundred people, a school for religious sciences with thousand students, primary and secondary schools with 1200 students and also a pharmacy and a clinic. The material for this article is mainly taken from سید ابوالقاسم خویی in Farsi Wikishia. This page has been accessed 46,589 times.